Head coach Tom Parrotta and the Canisius brain trust added seven new recruits for next season, with an emphasis on size. 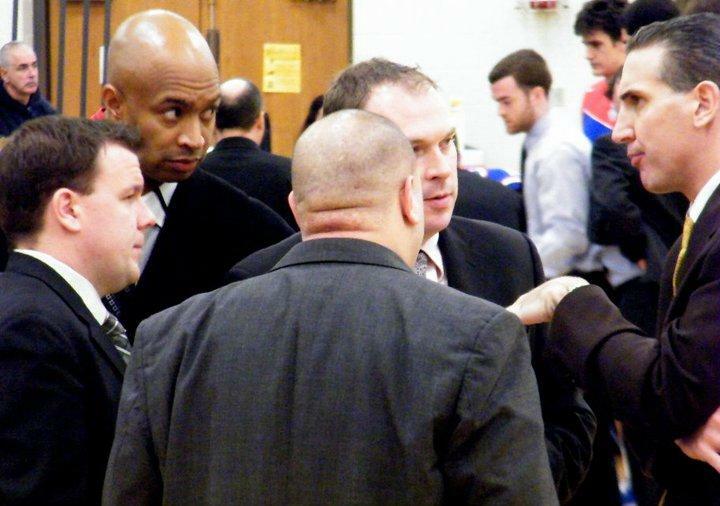 That's Parrotta on the right, and going clockwise, Director of Basketball Operations Gabe Michael (back of head), assistant coach Tim Paul (profile view), assistant coach Derrick Worrels (bald head), and associate head coach Rob Norris (middle). There will be plenty of new faces dressed in Blue and Gold next year at the Koessler Athletic Center. Tom Parrotta and his staff have signed seven new players for Canisius, meaning less than half of the 13 on the roster are returning members from this year’s team. Kansas State transfer Freddy Asprilla (6-10, 280) highlights the new signing class, although he will sit out next season due to NCAA transfer rules. Once thought to have quit college basketball for a pro career in his native Colombia, Asprilla seems to have had a change of heart. He will be joined on the bench by Issac Sosa (6-3, 190), who transferred to Canisius from Central Florida. Sosa is another player with ties to Art Alvarez, president and CEO of the Miami Tropics, one of the top AAU basketball programs in the country. Alvarez has a good relationship with Parrotta and Canisius and had a hand in getting other players in uniform for the Griffs, such as Gaby Belardo. Also notable, but likely unrelated to his decision, is the fact that Sosa majored in finance at UCF, a program Canisius is well-known for. Both Asprilla and Sosa will have one year of eligibility left to play in the 2012-13 season. The Griffs add size in 6-foot-10 Dutch center Kevin Bleeker, whom Parrotta recruited while watching former Griff Frank Turner play with his pro team in the Netherlands. Bleeker is listed on the U20 roster for BV Noordkop in the Netherlands. Jose Agosto comes to Canisius from Gatlinburg-Pittman High School in Tennessee, with a reputation for rebounding. Standing at 6-6, 215 pounds, Agosto appears to be similar to Elton Frazier (6-6, 208) and Tomas Vazquez-Simmons (6-7, 220), though matching their athleticism is one tall task. Of Puerto Rican decent, Agosto liked the strong Puerto Rican ties at Canisius. Josiah Heath and Harold Washington are the only American recruits. Heath (6-9, 230) hails from Irondequoit High School and is arguably the best player from the Rochester area. He replaces Vazquez-Simmons as the only Western New Yorker on the roster, which was important to him because he wanted a local school where his family could watch him play. Washington (6-1, 175) is a Maryland native coming to CC after finishing his two years at Cecil College (also in Maryland), which took sixth place in the national junior college tournament this year. He was reported to be scouted by Big East school Providence and MAAC opponent Loyola. The last addition to the team is Franklin Milian, who comes to Canisius from Our Savior New American School, the same high school as Marial Dhal. There seems to be little information out there about the 6-4 guard, but he’s money from behind the arc with his shirt off. 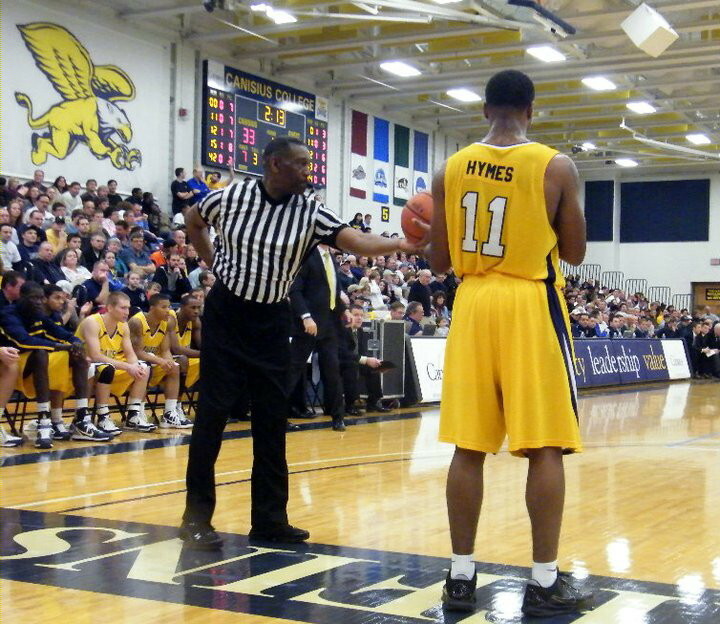 Alshwan Hymes is now Canisius' most experienced player, with 54 games played. The Griffs knew they’d be losing five seniors to graduation. Julius Coles, Greg Logins, Rob Goldsberry, Frazier and Vazquez-Simmons leave Canisius with their names scattered across the record book. Logins, Coles and Frazier have all expressed interest in playing professionally overseas. Logins will attend an overseas combine camp and has signed with the same agent as Turner. Freshman Ashton Khan, who was suspended earlier this year for a dorm room theft, will not return to Canisius next year and is looking for an opportunity with another school. David Santiago, who was also suspended for the theft, will be on next year’s team. Rokas Gricius, who was set to be one of two seniors on next year’s roster, has several internship and job offers and decided not to play basketball next season. He already began work on his master’s courses this spring semester. It is also reported that Eric Kindler will not return for the Griffs next season. He is rumored to be transferring to a school closer to his hometown of Camp Hill, Pa. Kindler’s departure has not been officially announced but the Griffs do not have any scholarships left to give. Faced with limited playing time, Rokas Gricius opted to pursue other opportunities. Next year’s schedule will be announced later in the summer but will include 18 MAAC games; a game in Harrisonburg, Va. against James Madison, as a return game for the 2010 BracketBuster; another meeting with Lamar University (Beaumont, Texas), who recently hired Pat Knight, son of Bob Knight who was fired by Texas Tech this season; as well as likely meetings with St. Bonaventure and UB, although a Big 4 tournament is still a few years off. The last game in Canisius’ contract with Syracuse University was this year, but the Griffs are likely to pick up games with another top-tier school, which come with a large paycheck. 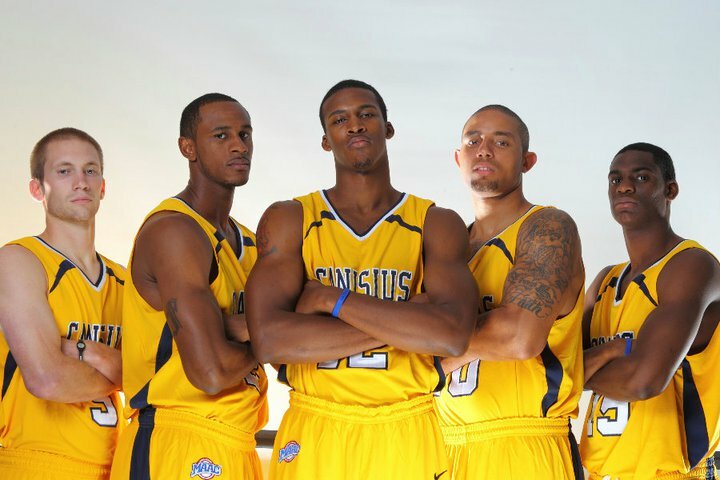 Canisius' own Fab Five (left to right): Rob Goldsberry, Tomas Vazquez-Simmons, Elton Frazier, Greg Logins, Julius Coles. 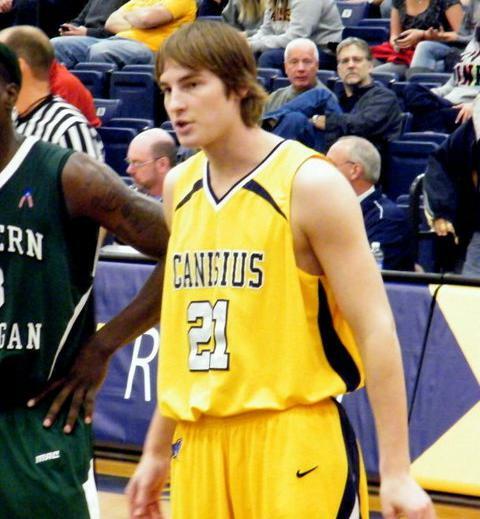 Don’t look now, but Canisius’ 2010-2011 men’s basketball season is already halfway over. Through 15 games, the Griffs have compiled a record of 7-8 and are just 1-4 in Metro Atlantic Athletic Conference play. Surely this is not the position the program hoped to be in at this point in the season, especially in a year it has five seniors who all contribute significant minutes. Canisius currently sits in eighth place in the MAAC, on pace to finish bottom-four in the conference for the 12th straight year. Canisius has played well at points this season but struggles with consistency. The Griffs have the potential to win on any given night, but even head coach Tom Parrotta admits the team hasn’t played to potential. Canisius is third in the league in scoring average at 69.8, which puts the team in the top half of the country. 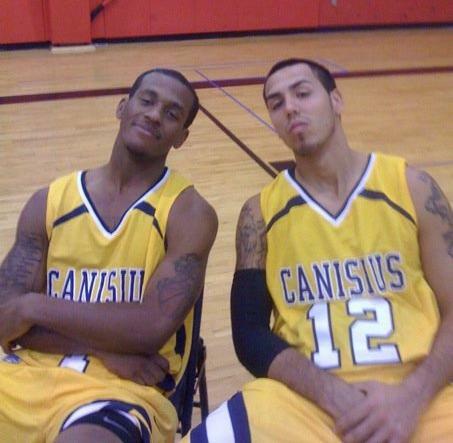 However, the emergence of Alshwan Hymes as a 3-point threat is the only thing that keeps the Griffs out of C-range. The first half against Rider last Sunday was about as well as the offense has been running all season. A shooting percentage over .500 and 20 points in the paint led to a 42-point outburst against a good team. The Griffs moved the ball well and the defense created offense. 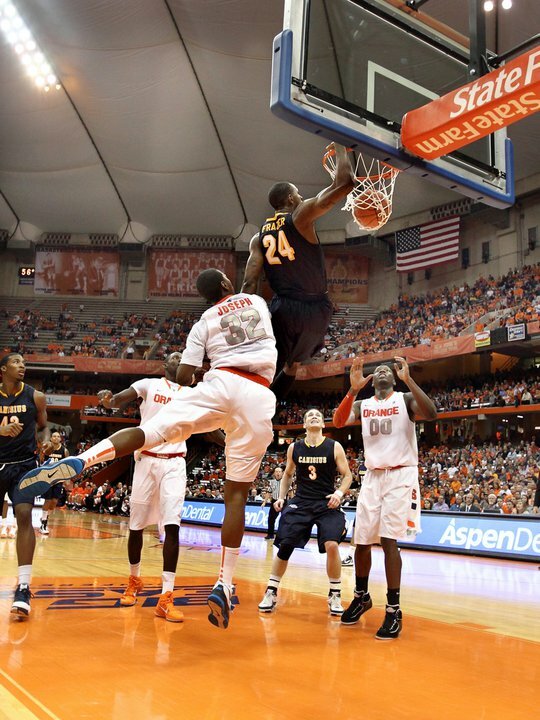 Elton Frazier dunks in the Carrier Dome. But over the next 20 minutes, Canisius went back to old habits. Settling for bad shots early in the shot clock is a good way to lose a lead. So is missing free throws. And giving up huge runs. Giving up runs has been a major problem for the team. Even after getting ahead early, Canisius frequently allows huge, momentum-swinging, lead-changing runs. Five or six minutes of bad basketball is more than enough to blow a game. The defense is just as much to blame for giving up runs, but if you keep scoring then it isn’t really a run. People in sports love talking about the “eye test”—whether or not it simply “looks good”—and that can be a good way to judge the Griffs. The half-court offense always seems lethargic and there isn’t really any killer instinct. Even against Siena’s zone last Friday, Canisius got the ball moving, but it just wasn’t moving fast enough. The individual play isn’t there either. No players are in the top-10 in the MAAC in scoring. Elton Frazier leads the team at 11.9 points per game (ppg). Julius Coles, a Preseason Second Team All-MAAC selection who averaged 13.6 points last year, is second on the team at 11.1. Hymes is third 10.6, and Gaby Belardo and Greg Logins are close behind at 9.9 and 9.5, respectively. Canisius could potentially have five players scoring in double-digits, but again, were talking about potential and not the real thing. The Griffs have been equally as shoddy on the defensive end as the offensive. Whatever points the unit earned against Siena, it handed right back against Rider. Tomas Vazquez-Simmons is tied for second in MAAC history with 248 blocks, but it’s going to take more than a few blocks to start winning some basketball games. The Griffs’ 70.5 points allowed per game puts them fifth in the league and 234th in the country. Though Canisius is thought to have decent size, a lot of the players are tall but not very wide. This difference between “big men” and “tall men” was exposed in the game against Syracuse. You can argue that Syracuse exposes weaknesses in everyone, but take the Rider game for example. Even one of the bigger men, Logins, was no match inside for Mike Ringgold. Their size does help them rebound, which is one of the few things they do well night in and night out. The Griffs lead the MAAC in rebounding average and are 80th in the country. Not allowing second chances is especially important for stopping runs, and can help in the transition game. Again, it goes back to the eye test. Far too often, opponents have open looks at the hoop before knocking down shots. Not sort-of open, wide open. If Division-I players have time to set their feet and look right at the rim, they are going to make shots. Six of Canisius’ seven wins this season came when they held opponents to under 40 percent from the field. That’s not a challenge, that’s something to work on. Marial Dhal has been a waste thus far, averaging just 4.3 minutes per game… in the ones he actually gets in to. There’s a problem when we’re getting excited over a season-high four points. Parrotta after Canisius beat Niagara in overtime last year (the white shoes were part of a promotion). The team is still falling into the same issues it had last season and the senior core is not as far along as one might have hoped. Two things Tom Parrotta teams are known for are rebounding and free-throw shooting. They have rebounding. Converting from the charity stripe is another story. The team works hard at this in practice, often hitting around 80 percent, but it hasn’t translated to the games. Not only does the team struggle to get to the line (last in the conference in FTs attempted per game), once they get there, the Griffs only convert 65.7 percent of the time. 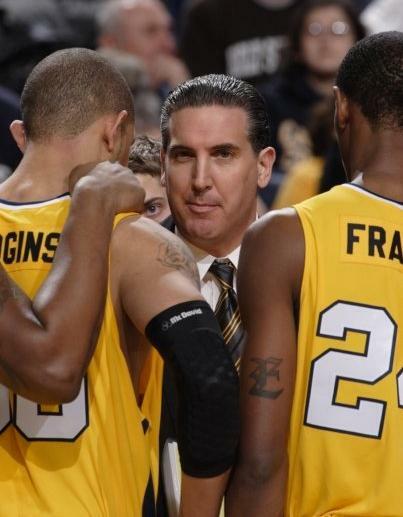 Parrotta was given an extension in the offseason to keep him with Canisius through the 2012-13 season, but the classroom aspect and potential recruiting issues played just as large a role in the decision as actual performance on the court. Graduating all seniors with master’s degrees is certainly honorable and looks great for the institution, but it doesn’t do much for the win-loss column. The fifth-year head coach has also had trouble getting change out of his team following halftime. The second half almost always plays out like the first, for better or for worse. Parrotta’s teams have held the halftime lead 57 times in his tenure, and they went on to win 40 of those games, good for a .702 percentage. However, when trailing at halftime, Parrotta-led teams rarely come back. When behind at halftime since 2006, Canisius’ record is 8-69. Looking at only MAAC games, the record falls to 4-42, or .087. Over the last two seasons, Canisius has never come back to win a game after trailing by more than 10 points, but as recently as last Sunday the Griffs blew a 14-point lead. The players certainly seem to like playing for Coach P, but alumni and fans need more. The matchup between Canisius freshman Chris Manhertz and UB freshman Javon McCrea will be a good one for years to come, but first Manhertz has to get himself on the court. While McCrea is atop the country in shooting percentage, Manhertz has been limited to only six games all season with an ankle injury. Canisius is getting fairly good production from its bench, which scores 24.1 ppg, or 35 percent of the offense. A few players have battled the injury bug this season, but depth is somewhat of a concern. Hymes usually comes off the bench, as does either Logins or Vazquez-Simmons. Redshirt freshman Reggie Groves has provided a spark and looks more and more confident with the ball in his hands. After those players, there are some question marks. Dhal has played 47 minutes all season and often looks lost. Ashton Khan looks like he can finish at the hoop, but hasn’t gotten into Parrotta’s rotation. Rokas Gricius hasn’t played since Nov. 23 against UB, sometimes due to injury, but usually due to coach’s decision. Eric Kindler played in every game but one in December, but still has work to do before he can think about being a regular contributor. A team searching for an identity after Frank Turner is yet to find it, unless inconsistency is what they are going with. A lot of excitement surrounded Belardo before the season as many slated him the next big thing for Canisius. The main knock on Belardo’s predecessor, Turner, was his turnover issues, but thus far Belardo has followed suit. Through 15 games, Belardo has 56 turnovers, more per game than Turner, which puts him 40th in the country. Belardo has 56 assists for an even assist/turnover ratio of 1.0., not comparable with the better guards in the league like Derek Needham (1.31), Justin Robinson (1.65) or Scott Machado (2.27). To be fair, Belardo is seventh in the MAAC in assists per game and has done a lot of good things too. Almost every opposing coach comments about him, and twice he has scored 19 points in a game. However, after UB showed how to eliminate Belardo from the game, opponents have watched that tape and adjusted their defense accordingly, at times stymieing the Canisius offense. Belardo’s 19 helped power the Griffs past St. Bonaventure in the opening game of the year, but we haven’t seen any fire from the Griffs since. A few alley-oops and heated moments here and there, but no defining, coming together moment. The MAAC is wide open this season and is there for the taking for a team with five seniors. But it’s going to take more than one win against a team above .500, which is how many Canisius has right now (Bonaventure). The MAAC Tournament is less than 50 days away. There’s light at the end of the tunnel if the Griffs can turn this thing around, but Parrotta’s group is going to have to put the pedal to the metal for that to happen. Everyone else was long-gone from the Koessler Athletic Center after a heartbreaking 77-76 loss to Rider Sunday afternoon, but Gaby Belardo remained. The redshirt sophomore stood on the free-throw line at the southeast end of the empty gymnasium, where he knocked down shot after shot from the exact spot he missed from with 11.3 seconds left in the game. For the second year in a row, Coles dropped 20 points on Rider at the KAC. Coles and Rider's Justin Robinson attended Blair Academy together. The Broncs’ Mike Ringgold brought the ball into the frontcourt as the seconds dwindled down. He tripped, and then regained his balance before putting up a wild layup. Justin Robinson got the rebound, and put up a jumper that didn’t come close to hitting the net. The air ball landed right in the hands of Novar Gadson with .7 seconds remaining. The Rider junior banked the ball off the backboard and into the hoop with no time left. The Broncs dog-piled on Gadson while the rest of the gym went silent. The referees went to the monitor to make sure Gadson got the shot off in time—he did—before running to the locker room amid a chorus of boos from the 919 in attendance. They weren’t so much mad about the last call, but how the game ended up and the series of calls that led to the finale. With the shot clock turned off and Canisius up by one, a loose ball went out of play and was awarded to Rider, much to the dismay of the crowd. Robinson got the ball on the inbound and missed a 3-point shot. The rebound came to Belardo, who raced down the court with a clear path to the hoop. The Broncs’ Danny Stewart was able to catch Belardo and did whatever he could to foul him. The referees put Belardo on the line for a one-and-one, instead of calling an intentional foul that would have given Canisius two shots. Belardo’s first shot rimmed out, and the rest is history. Head coach Tom Parrotta and Belardo both acknowledged that an intentional foul should have been called, and that they thought going for the basket with 12 seconds left instead of going into the corner to try to kill more time was the right play given the situation. “I was wide open,” Belardo said. Canisius started off the game on a 9-0 run and led by as many as 12 in the first half before taking a six-point lead into the locker room at 42-36. Led by senior Greg Logins’ 14 points, 42 marked the highest first-half production for the Griffs all season. Senior Rob Goldsberry got hit in the face by Gadson early in the second half after a scramble for a loose ball that was not called during the play. After a monitor review, officials assessed Gadson an intentional foul and awarded Goldsberry two foul shots, which he hit. Under previous rules, the only call that could come from a monitor review was a flagrant foul (and subsequent ejection; much like what happen to Canisius in last year’s Metro Atlantic Athletic Conference Tournament), or no foul at all. However, the NCAA changed that rule this season. The Griffs led by 11 points with 15:27 to play, but five missed shots and six fouls later, Canisius found itself on the wrong end of a 14-0 run that put Rider in front, 59-56, with 12 minutes to play. The rest of the game was hard-fought as neither team could pull away by more than four points. Five straight points from senior Julius Coles gave Canisius the lead at 76-75 with 1:40 left, but those would be the last points the Griffs would score on the night. Rider, which came into the contest top-10 in the country in 3-point percentage, hit 11 of 22 from behind the arc. Canisius shot 49.2 percent from the field and committed a season-low seven turnovers, but gave up 15 offensive rebounds. Coles finished with 20 points and Logins finished with 18 points and seven rebounds. Senior Elton Frazier had 12 while Goldsberry had nine assists and no turnovers. For the Broncs, Robinson finished with 19 and Mike Ringgold had 17. The loss drops Canisius to 7-8 on the year and just 1-4 in the MAAC, while Rider improves to 4-1 in conference play (12-5 overall). 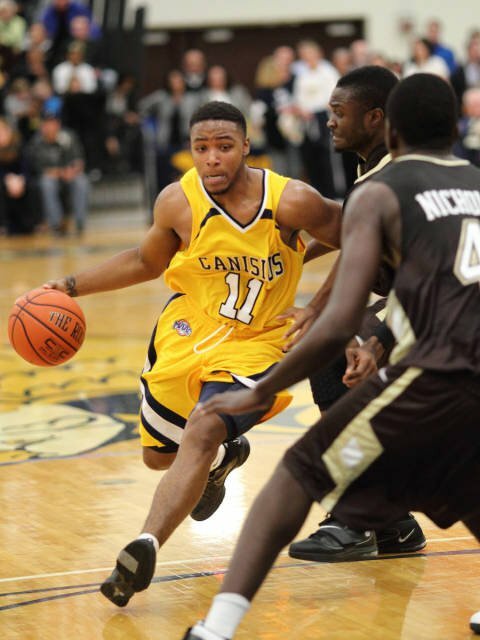 Dating back to 2006, Canisius has dropped 24 straight Sunday games. Alshawn Hymes is now shooting .427 from 3-point range, which puts him in the top-40 nationally. What a difference ten days can make. Just over a week removed from a sloppy 12-point loss to Northwestern State in Natchitoches, La., a completely different Canisius team took the court Wednesday night in Buffalo as the Griffs manhandled the Demons, 85-52, at the Koessler Athletic Center. It was a career day for sophomore Alshawn Hymes, who set the Canisius College record for most 3-pointers in a single game, with nine. “I came in this morning and I just felt like something hit me, like the team was ready to play,” Hymes said. “It’s something I felt it a couple games throughout the season so far, but it was just so much stronger tonight. Hymes finished the night with 28 points, the highest single-game output from a Griff since Frank Turner put up 30 against Southern Miss on Dec. 22, 2009. Senior Julius Coles also had a night to remember, as his 15 points put him over the 1,000-point mark for his career. He is the 31st player in school history to accomplish the feat. The teams traded baskets early on the contest, with Canisius leading 12-11 just over five minutes into the game. The next five-minute block was an uneasy one for Canisius supporters. The Griffs went on another one of their infamous first-half cold streaks, missing 12 consecutive shots while being outscored 10-0 over the drought. Sophomore Gaby Belardo knocked down a jumper with exactly ten minutes to play in the half, and it was the start of the comeback. Instead of turning the ball over and committing fouls like they did in Louisiana, Canisius controlled the boards and started making shots. Twelve points from Hymes over the next seven minutes helped back a commanding 26-2 run that put Canisius back in the driver’s seat as they went up 38-23 and never looked back. The Griffs finished the game with 43 rebounds—21 defensive, 22 offensive. The team also had 16 steals while forcing the Demons into 29 turnovers. Like Emilio Lopez in Mr. Deeds, Tom Parrotta is very very sneaky. Even with a big lead, Parrotta stuck with his main rotation of eight players. Freshman Ashton Khan and junior Marial Dhal checked in with 2:06 left in the game and freshman Eric Kindler did the same with 1:03 to play. Dhal didn’t collect a rebound but blocked two consecutive shots in a three-second span. Junior Rokas Gricius missed his third straight game with back spasms and freshman Chris Manhertz continued to be bothered by a bad ankle. Canisius (6-6) shot 41.4 percent from the field while holding NSU (8-5, 1-5 road) to 33.3 percent. Up next for Canisius is a road game at Saint Peter’s on Monday, Jan. 3. The Peacocks had won five straight games before losing star players Wesley Jenkins and Ryan Bacon to injury during Dec. 21’s game at Binghamton. Jenkins is reported to have re-injured the same right knee he partially tore his ACL in over the summer, and Bacon is reported to have a sprained ankle. There is no official word yet on whether either player will be ready for the Canisius game, although neither played Wednesday night against Lehigh. Jeron Belin and Nick Leon now lead the charge for Saint Peter’s. Both are good players, but this would be a great way for Canisius to make up ground in the Metro Atlantic Athletic Conference standings. Buffalo Bills tackle Demetrius Bell was on hand at the KAC for the game. Bell is a graduate of Northwestern State. He originally went to the school to play basketball. Bell (right, obviously) with a member of the Canisius High School pep band. Nice smile. Coming into the contest, the Demons’ William Mosley led the nation in blocks per game (4.3). That was only extra motivation for senior Tomas Vazquez-Simmons, the school’s all-time leader in blocked shots, who joked that since both players wear the same number, he was glad to show people who the best number 42 is. Mosley finished the game with four blocks. Vazquez-Simmons had five. Rob Goldsberry. Five assists, no turnovers, three rebounds. Sold a lot of foul calls early when the Griffs needed it. It’s the little things.